In the morning on 2 September, a formation of nine R-Zs, escorted by a similar number of I-15s, were attacked by 18 Spanish-flown CR.32s near Monterrubio de la Serena as they returned from a bombing mission. Minutes later nine SBs from 4a Escuadrilla of Grupo No 24, escorted at a distance by 11 I-16s Type 10, hove into view too. The CR.32s concentrated on the Tupolev bombers and their monoplane fighter escorts. In a single attack, capitán Ángel Salas (2-G-3) destroyed three Katiuskas, and then capped this by damaging the I-16 Type 10 flown by the leader of the 1a Escuadrilla Grupo de Moscas No 21 that was escorting them. This pilot, teniente José Redondo Martín (the son of the former mayor of Madrid, Cayetano Redondo Aceña), took to his parachute and was guarded by Salas until he had almost reached the ground. Salas, before flying away, raised an arm in the Fascist salute, and Redondo (I-16 ‘CM-214’) responded in a similar manner with a clenched fist. In this combat 2-G-3 also claimed four more Ratas (teniente Manuel Vázquez Sagastizábal (1-E-3), teniente Alcocer, teniente Carlos Bayo (2-E-3) and teniente Esteban Ibarreche) and one more Katiuska (teniente Salvador Serra Alorda (1-E-3)). On 9 February 1939, five I-15s were claimed by Spanish pilots near Peñarroya, in Andalusia. Two were credited to capitán Arístides García López (8-E-3), taking his overall tally to 17, and one each to Juan Frutos Rubio, teniente Antonio Manrique (1-E-3) and teniente Alcocer - the latter two pilots each ‘made ace’ with these successes. Alcocer ended the Spanish Civil War with 5 biplane victories. He later volunteered for combat in Russia and was part of the 1a Escuadrilla Azul, (Escuadrilla Expedicionaria) which was formed with 17 pilots with Salas as the Commander. Some of them were veterans of the Spanish Civil War and had a combined score of 79 aerial victories. 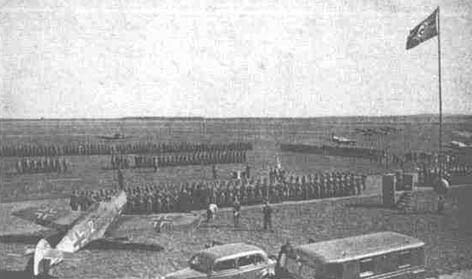 At first, the Spanish pilots were worried that they would arrive late to see any action, since they were kept informed of the progress of the German advance towards Moscow. The 1a Escuadrilla received a total of 12 Bf 109E-4s and –7s and they were assigned to JG 27, VIII FliegerKorps of LuftFlotte 2. They were known as the “15 Spanische Staffel”, and they started to fly their first combat operations on 2 October and suffered its first pilot causality in that same day, when Alcocer was killed in the first mission. At the time of his death, Alcocer was credited with 5 biplane victories. (a) Five I-15s were claimed by Spanish pilots. These were the last CR.32 claims in Spain.